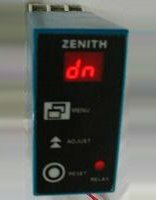 Zenith Instruments manufactures counters, transducers and timers. For custom-designed units, please contact us. Time selected from 0.1 seconds to 99 hours in 6 overlapping time ranges. Microprocessor based 2 digit dispay for accurate setting of time. Elapsed or remaining time can be displayed. Relay energised on contact closure,and falls out on completion of timing cycle, or relay energised after preset time has been completed. Flashing LED indicates timing is in progress. Flashing rate increases as time period is about to end. The Model 489-6D is a multi-function 14mm 6 digit red LED timer or counter. The various options are accessable via an intenal dipswitch. The Model 489PSET is a multi-function 14mm 4 digit red LED presetable counter or timer. The various options accessable via an internal dipswitch. The unit can also be manually reset, or automatically after a preset time. The 11 PIN Timer / Counter is a multi-function Timer / Counter with a 2 digit display. To indicate the current progress of the Timer / Counter please refer to our Technical Department for further information regarding this model. The Transducers that we supply are current Transducers that accept the secondary current from a C.T. ie 0-1 AAC or 0-5 AAC and convert it to a galvanicaly isolated 4-20 mADC signal. Home Counters, Transducers, Timers etc.